I made this a little while ago and forgot to share it here. It's a flying geese cushion that I will be teaching as a class at Patchfinders. I hand quilted it with Sashiko thread and I'm especially pleased with my covered zip on the back! I had to snap some pictures quickly while I was at work because it's on display. The class is full now but I've put a tab to list all the classes I'm teaching at the top of my blog. Hopefully I will be teaching more in the new year too. I'm working on a couple of hand sewing projects right now and although I'm enjoying it, I am starting to feel the need for speed! I am actually missing my machine so I think I need a little quick make this weekend and I have the perfect project in mind. If you live in the UK or Ireland enter my £100 Wayfair gift cerficate giveaway - they have everything you need for your home, from furniture to accessories and so many useful items! Please share this giveaway on social media too, I would really love to help someone get pretty and useful things for their home and even the postage is free! I love your hand quilting as well. Have fun teaching! The hand quilting on this is stunning, and I love the whole thing. Great work! I love your cushion and the hand quilting is a perfect touch too! Gorgeous cushion! I love the binding print! You do have such a great eye for putting fabrics and colors together. This is so appealing! A beautiful cushion, Lucy. Your hand stitching is so, so neat and even!!! 'Need for speed'... that's why I can only do hand stitching every now and then, even though I find it quite therapeutic. 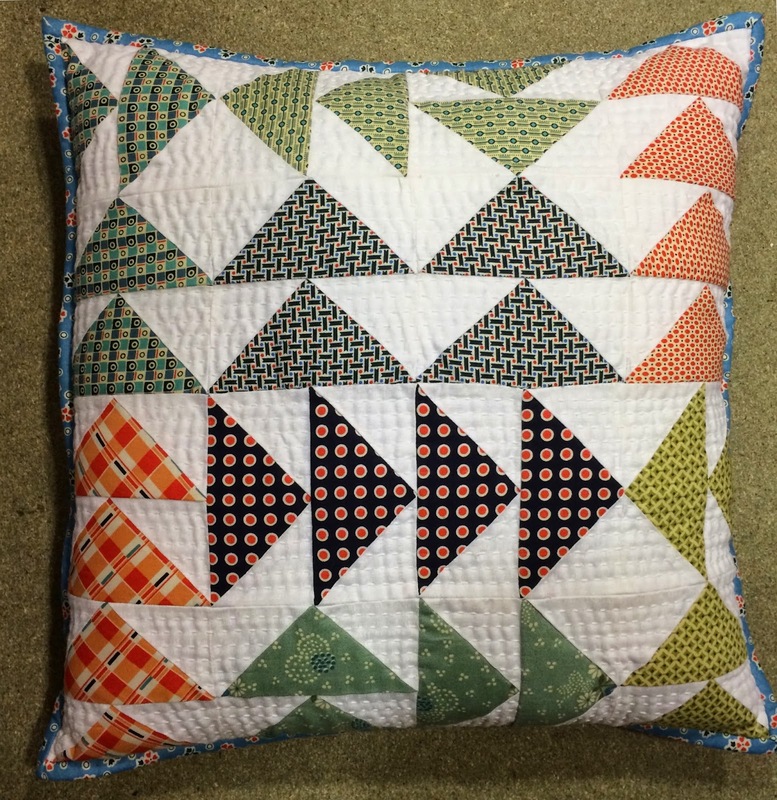 I really love the hand quilting and the cushion itself is beautiful. I'm always so inspired by your hand quilting projects. I'm definitely considering taking the dive with it on my mon's paper pieces quilt when it's finished. Look at your beautiful hand stitching Lucy! You are becoming quite the expert! Gorgeous! Love the cushion and it's brilliant you get to teach and pass on your skills. Love a flying goose and your hand quilting is gorgeous, so textured with the sashiko. Good luck with your class. love this! I really need to make some cushions for my house! Beautiful, Lucy! I love the texture that the hand quilting gives it. Great fabric palette! Very nice, Lucy! Thanks for sharing at TGIFF Linky Party! Oh that looks awesome. Well done you!